A simple flea bath or collar isn't going to eradicate fleas on your pet and in your home. Learn the flea life cycle to fine-tune your efforts. Fleas can make pets' lives miserable, and humans begin to itch just at the thought of them. 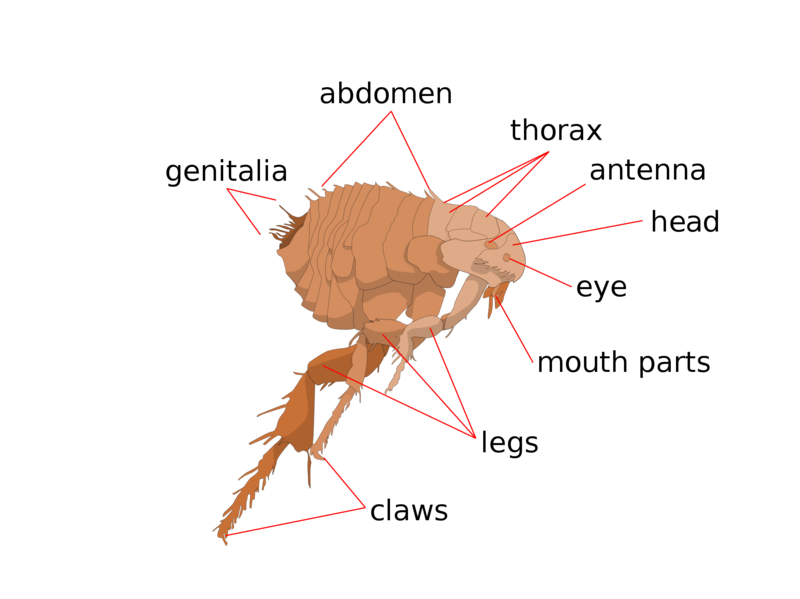 Part I of this article is to give some insight into the biology of the flea. Why go back to biology? Because the flea life cycle is fairly complex, and understanding the various stages will make it easier to get rid of them. It is easy to feel defeated when fighting fleas. A multi-pronged approach is necessary to rid your home and pets of these pests. Diatom cell walls are made of silica, a component of glass. DE has been used for years as an insecticide to control mites, fleas, and other insects; find out how it works here. What Are the Little "Black Pepper" Spots on My Pet? This Frequently Asked Question (FAQ) is from Margaret. "My question is: my dog has these little black things in her fur that like little spots of black pepper..." Find out the answer to this commonly asked question and how you can do a quick little test at home to verify what this "black pepper" stuff is. What Are the Best Methods to Control Fleas on My Pet and in My House? Fleas have a complex, 4-stage life cycle. Control of fleas on your pet and in your home must address all stages of this life cycle to stop the problem of flea infestation. This article will cover several different methods that are effective at controlling fleas when used properly. Why Does My Pet Have Fleas When Flea Control Products Are Regularly Applied? Viewer question from the Veterinary Medicine forum: ANGELAESQUILIN asks: "My five-month-old Cocker Spaniel has been on Frontline® for three months now. Every Saturday I give her a bath also using a flea and tick shampoo recommended by my vet. Yesterday I saw her scratching herself and decided to check her with a flea and tick comb. To my amazement, I removed two fleas from her coat. I am not sure what I have done wrong for her to get fleas. Why Is Flea Control so Difficult? Fleas. They make pets' lives miserable, and humans begin to itch just at the thought of them. Vets are often asked what pill, drop, dip, collar, or shampoo works the best to get rid of these persistent parasites. The answer is that there is no single method or insecticide that will completely eradicate (or at least control) a flea problem. The flea life cycle is fairly complex, and understanding the various stages will make it easier to get rid of them. How to get the most out of a flea bath, the start of a good flea control program. Not every itchy dog (or cat) has fleas, though. Be sure to consult with your veterinarian if your pet is itching or has inflamed skin before initiating treatment or special shampoos. Yes, fleas can make pets and people itchy and uncomfortable, but don't always assume that your pet's itchiness is the result of fleas. Learn about flea allergy and some other possible causes for your pet's itchiness. This article is not specifically about fleas, but a good case history and workup of two itchy dogs. Lianne McLeod, an exotic pets expert, has written an extensive "dermatology diary" account of her two dogs who suffer from itchy skin and hair loss. Learn what is involved in a veterinary referral work up; how skin diseases are examined and ruled out, the topical medications, oral medications and special diets that veterinary dermatologists use to diagnose and return their patients to good health.